Strange Bedfellow. A collaboration between ceramist, Rima Schulkind, and Lynda Smith-Bügge, Strange Bedfellows, combines the use of wood and porcelain. The raw edges of the interior burl, contrast the curly cued porcelain inserted though out the wood. 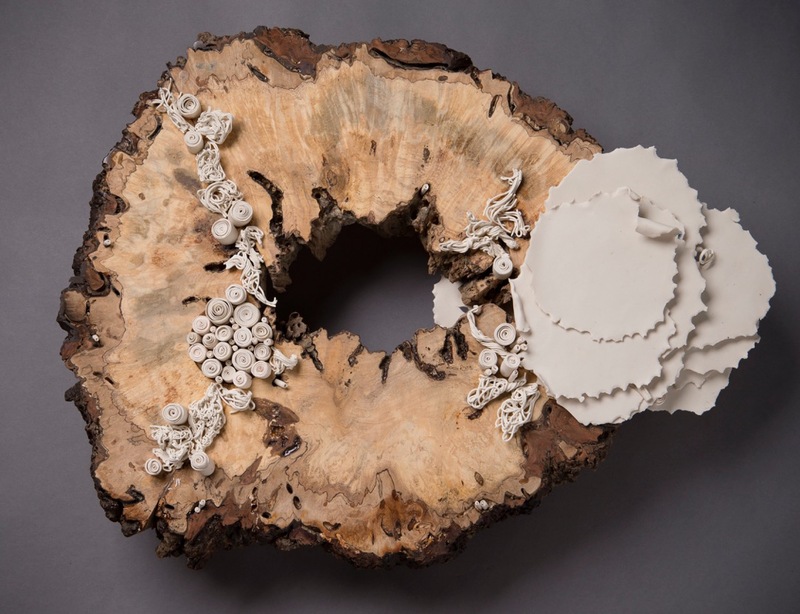 The porcelain looks like botanical organisms and fungus adhered to the wood. The contrast of off-white porcelain and the varied browns of sliced burl emanates peace and serenity. The repeated circular patterns radiate a sense of stability. The tunnels of the burl burrow deep into the wood.